This article introduces different approaches for digitizing photographic material. A particularly detailed focus is put on “Scanning with SilverFast”. However, a small inaccuracy has slipped into the article: The article states, any dust and scratch removal is always accompanied by a loss of sharpness. That is correct in relation to many common tools, but does not apply to SilverFast iSRD and SRDx. And that is exactly what is exceptional with our dust and scratch removal tools iSRD (infrared channel based) and SRDx (software based): Both do not blur the images; therefore, the basic detail sharpness remains fully intact. 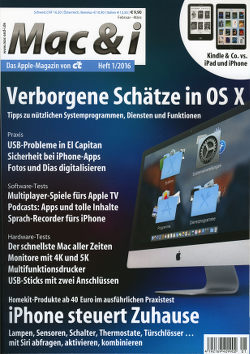 The complete article (German) can be found in the current Mac & i issue (# 1/2016) or for downloading from the heise archive (as PDF for 3,29 €).